Astronauts on the International Space Station temporarily evacuated the U.S. section of the orbiting lab on Jan. 14, 2015 due to an ammonia leak alert that was later found to be a false alarm. Crewmembers on the International Space Station have now been allowed into the U.S. segment of the orbiting outpost, after a false alarm caused astronauts to evacuate that part of the station early Wednesday (Jan. 14). The alarm could have indicated a possible leak of toxic ammonia into the station's cabin; however, NASA has found no evidence of a leak. NASA astronauts Terry Virts, Barry "Butch" Wilmore and European Space Agency astronaut Samantha Cristoforetti re-entered the U.S. side — which include the European, Japanese and U.S. station modules — wearing masks at about 3:05 p.m. EST (2005 GMT). Cristoforetti and Virts took samples of the station's air and found no ammonia, according to NASA. "The crew is in good condition, was never in any danger and no ammonia leak has been detected on the orbital laboratory," NASA officials wrote in an update. Virts, Cristoforetti and Wilmore joined cosmonauts Elena Serova, Alexander Samokutyaev and Anton Shkaplerov in the Russian segment for much of the day after the alarm sounded at about 4 a.m. EST (0900 GMT). Because there is no sign of ammonia in the cabin, the crewmembers should be allowed to take of their masks and roam freely through all parts of the station, according to NASA. Officials now think that the false alarm may have been caused by an error in a computer used to beam information to and from the space station. The computer, called a multiplexer-demultiplexer, now seems to be in good shape after officials turned the device off and on again, NASA officials said. NASA Astronaut Terry Virts and European Space Agency astronaut Samantha Christoforetti reenter the U.S. segment of the International Space Station on Jan. 14, 2015 after an ammonia leak false alarm. Mission Controllers are still working to understand exactly what set off the alarm, but work for the astronauts should continue as normal on Thursday (Jan. 15). NASA officials will now take steps to re-activate a cooling loop powered down because of the alarm. NASA officials do not think that the research on the station was negatively impacted because of the evacuation. The false alarm Wednesday was the third of its kind to occur in the more than 15 years crews have lived on the space station. 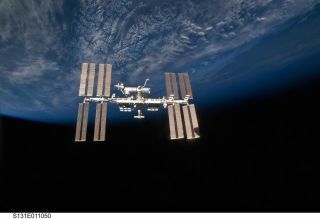 Crewmembers have been forced to evacuate the U.S. side of the outpost, taking refuge in the Russian side, two other times due to a false ammonia alarm, NASA spokesman Rob Navias told Space.com via email. Rotating crews of astronauts and cosmonauts have continuously manned the International Space Station since 2000. The station has the approximate living space of a five-bedroom house.